Israeli biomedical company Regentis Biomaterials announced today the closing their $15 million Series D funding round, led by Chinese pharmaceutical group Xizang Haisco Pharmaceutical Group Co. Ltd, a leading Chinese pharmaceutical group listed on the Shenzhen Stock Exchange (SHE:002653). Also participated in the round existing investors: Medica Venture Partners, SCP Vitalife Partners, Italian asset manager Generali Investment, and the technology transfer company of the Technion, T3. Regentis CEO and President is Dr. Alastair Clemow. Regentis Biomaterials is developing hydrogels for tissue regeneration originally developed at the Technion University by Dr. Dror Seliktar. The company’s flagship product, GelrinC™, combines the stability and versatility of a synthetic material with the bio-functionality of a natural substance. Currently the treatment is under clinical trials for the treatment of articular cartilage lesions. Last year Haisco Group invested in two other Israeli medical device companies: $10 million were invested in October 2015 in Endospan and in July 2015 they invested $5 million in MST – Medical Surgery Technologies. Israeli cyber security startup Kaymera has raised $10 million in a round led by a Hong Kong / China venture fund GOEC with additional participation from Israeli angel investors Eddy Shalev and Yariv Gilat. Using the newly raised capital, the company is expected to hire 10 new employees at their office in Herzliya as well as opening offices abroad. Founded in 2013 and led by Co-Founder and CEO Avi Rosen, Kaymera has developed a mobile cyber defense system to provide enterprises with a multi-stacked approach that includes hardware enforced endpoint protection, encrypted data and behaviour analytics to monitor and mitigate mobile threats. Kaymera’s flagship product is a secure operating system called Kaymera 360°, which is available for the Samsung Galaxy, LG, Nexus, HTC and OnePlus One. It touts a three-tiered defense that blocks malware penetration, overlays a sophisticated resource permission process based on each app’s risk assessment, and a third layer that analyzes app misbehavior and deploys countermeasures. The company was co-founded by CEO Avi Rosen, Shalev Hulio, and Omri Lavie in 2014. Hulio and Lavie’s previous venture, NSO, also received angel support from Eddy Shalev. Israeli tech companies raised $4.43 billion in 2015, 30% more than in 2014. The number of deals was also a record. 2015 was a record year for fund raising by Israel's high tech industry. Israeli tech companies raised $4.43 billion last year in 708 deals, according to figures released by IVC Research Center and KPMG. The amount and the number of deals are both all-time highs. The amount raised is 30% above the previous high, recorded in 2014, when 690 deals totaled $3.42 billion. The average deal peaked as well, at $6.3 million in 2015, compared with the previous year's $5 million average round and a $4 million average in the past ten years. VC-backed deals accounted for 72% of capital raised in 2015, with an outstanding $3.2 billion closed in 397 deals, or only 56% of deals. 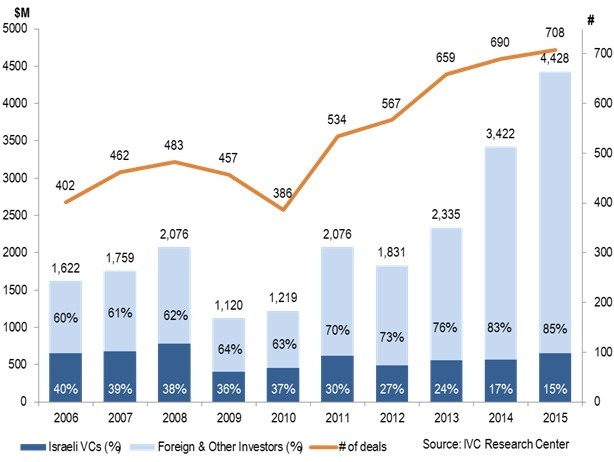 The past three years have seen consistent 30% annual growth in capital raising in VC-backed deals. The compilers of the report comment, "It seems the increase in VC-backed capital raising is therefore mostly explained by the increase in the size of the average financing round where VC funds participated. The average VC-backed deal in 2015 reached nearly $8 million, an unprecedented record, well above the $5.9 million average in 2014, and much higher than the $4.4 million average VC-backed deal in 2013." Ofer Sela, partner at KPMG Somekh Chaikin's Technology Group, warns that the slowdown in investment in the rest of the world will catch up with Israel. "In the last quarter of 2015, the trend Israel ran contrary to that of the rest of the world. While global markets were affected by the slowdown in the Chinese stock market, an unstable global economy and the interest rate hike in the US, Israel remained untouched by this global wariness. We expect the Israeli market to slow down if the bear market persists. The general current sentiment in the Israeli market is that 'winter is coming'," Sela said. IVC Research Center CEO Koby Simana said, "As of the second quarter of 2014 and throughout the past year, we have repeatedly pointed to the uptrend in the number of large deals and their sizes. We’ve seen growth stage companies raising substantial capital to boost their growth rates and grab larger market shares. The trend was largely fueled by the influx of capital from foreign investors, and a shift in market trends may indeed cause a slowdown on that front. "However, there’s still room for Israeli high-tech companies to find both organic and non-organic growth, and materialize their full potential. We’ve seen in the past year a 25 percent hike in the number of Israeli growth stage companies, and the numbers keep growing. At the same time, there’s an increase in the capital dedicated to growth investments by late stage and growth focused VC funds, which are expected to continue investing even if the market slows, or even capitalize on the slight decline in valuations that a possible slowdown may cause." Israeli venture capital funds accelerated their activity in 2015, investing $653 million, which compares with $568 million in 2014. Their share in the total amount of capital raised, however, continues to fall, reaching a low of 15% in 2015, compared with 17% in 2014 and a 30% average share in the past ten years. Israeli VC funds placed a total of $236 million in first investments, which accounted for 36% of their total placements, up from 30% in 2014 and 2013. In the breakdown by sector, in 2015, 181 software companies led all capital raising with $1.3 billion or 29% percent of the total capital. They were followed closely by Internet companies, with 172 deals raising just under $1.3 billion. The life science sector followed, with 22% of the total capital raised in 2015.